For their new album Sugar at the Gate, Montreal quartet TOPS decamped to Los Angeles to build a makeshift studio in a former brothel called ‘Glamdale’. “We insulated the walls, got office dividers, and made it into a studio and practice space that we could use 24 hours a day,” lead vocalist and songwriter Jane Penny says over the phone. “To have that amount of space and ability to focus on the music, it felt like my consciousness elevated. There’s a mental impact of having that space and time.” Listening to Sugar at the Gate, you wouldn’t necessarily know about their studio’s seedy origins: like their last album, 2014’s Picture You Staring, it teems with AM radio pop-style hits, all sunshine melodies and classic driving songs. It’s meant for the wide roads and suburban street coasting in top down Cadillacs across the West Coast. As Penny explained when the album was first announced, Sugar At The Gate is informed by their new surroundings. Like fellow Canadians Joni Mitchell and Neil Young, it follows the myth of moving to California to find new success. As well as her compatriots, Penny says that she was told by her band members to “be like Kim Gordon” in her pre-Sonic Youth years: a faux-hippie imbibing what the new climate has to offer. 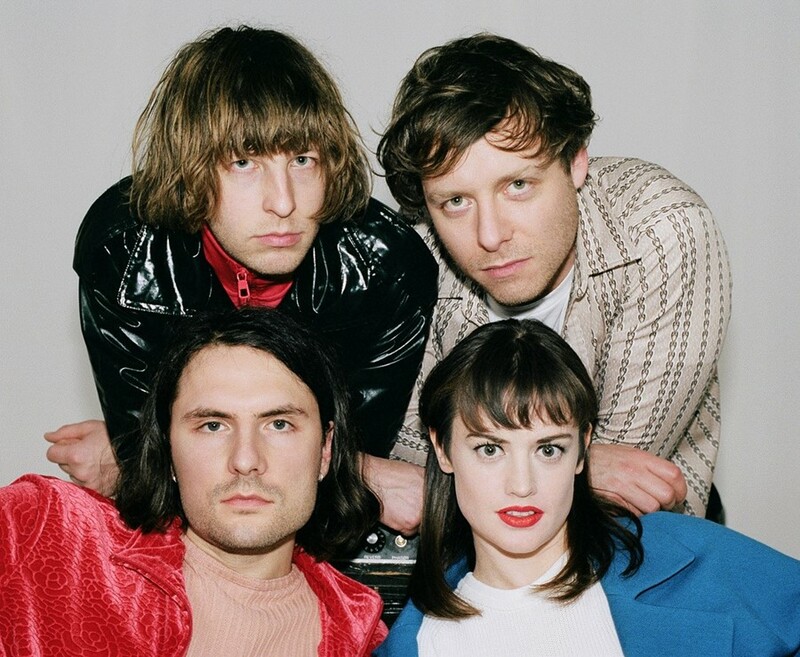 In their new video for “Petals”, the band contrast the song’s late 70s vibe with footage of Penny partying with Michael Jackson, Prince, and Madonna at a flat before she drives around Forest Lawn Memorial Park where The King of Pop is buried. We spoke to Jane Penny about the video, playing out her fantasies in Los Angeles, and what people can expect from their forthcoming album. Jane Penny: The impersonator idea was a silly idea that we had after practice one day. We wanted to have multiples of everybody – like four Michael Jacksons – but it was hard to find that many people who impersonate celebrities for a living. I decided to direct all of the TOPS music videos (for this album), and I liked the idea of starting with (an idea that) we came up with together to stay true to TOPS. ‘Petals’ is a song that tries to capture the energy and positive feelings of our band. I invited all these people to come (to the video shoot) from online gig sites. Me, a good friend, and another friend decided to put it together and see if it would work. We were able to shoot on 35mm film, so it ended up with a strangeness and a cinematic quality that exceeded my expectations. What was the significance of having Michael Jackson, Shania Twain, Madonna, and Prince impersonators compared to say, Cyndi Lauper or George Michael? Jane Penny: Something about the concept that was interesting to me is that, culturally, certain stars are brighter than everyone else. We were living near the Forest Lawn Memorial Park and Michael Jackson is buried in a mausoleum away from everybody. I had this fantasy of me and Michael riding around the cemetery, hanging out as friends, that I thought would be fun. There’s a line in ‘Petals’ that stands out: ‘Make it worthwhile / Inheritor of the shade / Finger pointing / Where the light used to lay.’ Can you explain the meaning? Jane Penny: When you’re in Los Angeles, the sunlight can be so intense. LA means so many different things to different people. Certain areas show the wealthiest people and the poorest people in America. ‘The shade’ is the idea of protection and privilege, and how that gives you the luxury of perceiving the world around you when others are forced to get through it. The people who work in the creative industries in LA (come) from a point of privilege, so people are sitting in the shade and speaking of the world through contradiction. They happen to be in the shade, and they create a rationale around why they’re supposed to be there versus other people. People always assume there’s a divine reasoning behind their own positioning in life – like they’re meant to be there. What influenced the decision to move to LA? What did the city offer that Montreal couldn’t? Jane Penny: It’s not super glamorous to say this, but our drummer is from California and was having immigration issues in Canada. There was a desire to stretch our experiences a bit. What happened when we got to Los Angeles was we realised the amount of space you can get to create for yourself. We were lucky to get the house (Glamdale) with a garage, so we insulated the walls, got office dividers, and made it into a studio and practice space that we could use 24 hours a day. For me, to have that amount of space and ability to focus on the music, it felt like my consciousness elevated. There’s a mental impact of having that space and time and also being in a place that is full of expectations of people. It became very important that I challenged myself and understood what I was doing and why I was doing it. It put a certain amount of pressure on TOPS that, if we were going to make a record that fully defined what the band is, we would do it there and then. As a songwriter, it forced me to decide what I wanted to say, how I wanted to say it, and how I wanted to make pop songs with interesting lyrics that reflect a feminine experience of the world that’s also intelligent. It brought to mind so many different fantasies I had about being in a band. If I was going to have this prototypical Californian experience, maybe it was this delayed experience I was owed in my dream. Jane Penny: There’s a song on the record called ‘Hours Between’ – that’s where it’s taken from. It has a double meaning: the idea of a gateway to satisfaction and pleasure, and the idea of a barrier; the things that are kept from people, and the way the good stuff in life is held back and beyond the gates that you can’t cross. TOPS, in some ways, can feel light and fun, but we do have a concern with the world and have something that we want to say and express. Sugar at the Gate references what we are and how we’re perceived, but it’s also a strange package of words – which I think is what TOPS is, if you go a little deeper. What can people expect from the record? Jane Penny: People who are really familiar with TOPS will be happy that it’s still really listenable. People that have seen the band live will be happy to see that we’ve been able to capture more of the energy of our live shows in the recordings. I feel like it’s the most varied record that we’ve made; we’ve taken all of our influences and stretched them. It sounds more like TOPS than we ever have before.